Rose Cottage 01263 715779work01603 870304fax Self-cateringA charming flint cottage that has been beautifully decorated in a stylish and very comfortable way. This is a lovely spot to stay if you are wanting to be close to the coast but also rural Norfolk. Other: Towels, Books and games. Radio and clock radio. 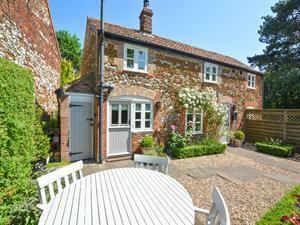 A charming flint cottage that has been beautifully decorated in a stylish and very comfortable way. This is a lovely spot to stay if you are wanting to be close to the coast but also rural Norfolk.